Hey there We R fans! Laura here today sharing how to make this pretty Thanksgiving hoop wreath using the new bow loom. Making bows is so easy with this fun tool, and you can create a variety of sizes and styles of bows using one tool. I started by adding some wired gold burlap ribbon on the hoop. Simply take the hoop apart and place a strip of burlap between the two pieces, leaving some of the ribbon outside of each side of the hoop. Add a long piece of ribbon to hang the wreath with at the top while you have the hoop open. Tighten the hoop closed. I added gold Thickers letters to the burlap to spell out the word ‘thankful’. They seem to be sticking okay, but I may need to add some hot glue to the backs if I find they are popping off. Now onto the fun part of creating some bows for the wreath! The bow loom is easy to use. It is marked with various widths, so you can make the perfect size bow. You can wrap your ribbon around as many times as you want to create the number of loops you want. I love those big beautiful bows you see on wreaths that have lots of different ribbons all attached together to make one big, gorgeous bow. I knew I could use the bow loom to create a bow like this. I started by using large 2” wide wired ribbon. I wrapped the ribbon once on the bow loom at the 8-inch marks. I twisted a long piece of floral wire to cinch up the middle of the bow. You can also use string for this step, but I think floral wire is easier when adding more ribbons to the bow. Pull the ribbon off the bow loom and trim the ends. Leave the ends of the twisted floral wire long to attach the other two bows. Next, I used some thinner gold ribbon. I wrapped it around twice at the 6-inch mark on the bow loom. Use the wire from the first bow and twist it around the center of the new gold bow, so that both bows are attached to each other using the same floral wire. Remove the ribbon from the loom and trim the ends. Lastly, add another thin brown and gold ribbon to the other two bows. This time I used the four-inch mark on the bow loom and created three loops for this final bow. Once the al the ribbons are attached together use a small piece of brown and gold ribbon to wrap around the middle. Secure it on the back with hot glue. I also created three smaller double looped bows using the bow loom. I used the 3-inch mark and the thinner ribbon. I used floral wire to cinch the middle of the bow and then wrapped another piece of ribbon around the middle of the bow to give it a finished look. Once I had all my bows made, I added some different florals stems to the bottom of the hoop using hot glue. I hot glued on all the bows – the larger one in the middle and the three smaller ones on top. This wreath turned out so beautiful and the gold touches are so pretty in person. The big bow turned out even better than I had hoped. The smaller bows at the top add a fun and whimsical touch to the wreath. I can’t wait to use my bow loom this year to make beautiful bows for all my holiday wrapping! Hello We R Memory Keepers fans! Soraya here today to talk about one of the most amazing tools for planner addicts like me: the Planner Punch Board! You can add as many pages as you want, you can insert homemade dividers, photo pages, various documents… with only one tool! Let’s collect our memorabilia and let’s fill our planners with what makes us happy! 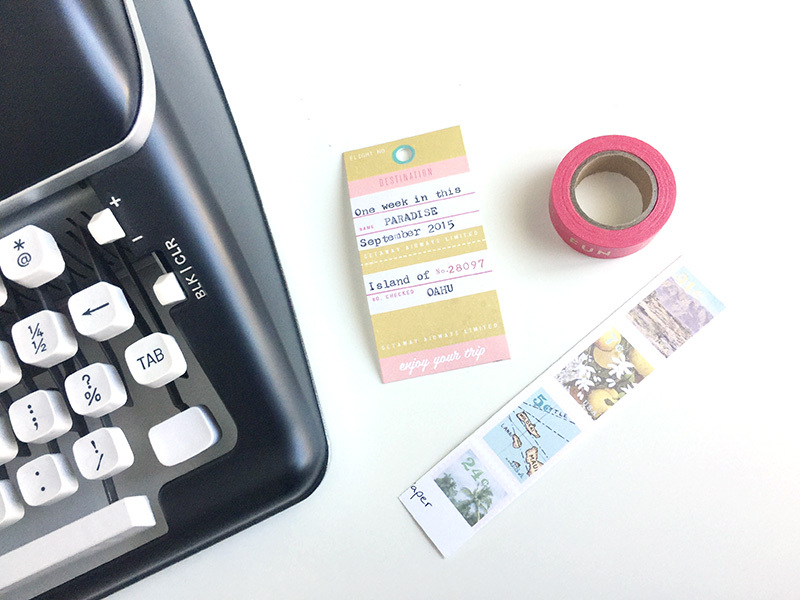 I’m using the Heidi Swapp mini Memory Planner but as you can see, the Planner Punch board can be used with any planner! So smart! Just give a look at the chart (behind the tool) and find your planner reference to know exactly where you’ll need to place the little punches. Once you’re ok with the settings, just place your piece of paper (mine measures 17cm x 9cm) on the Planner Punch Board. You will need to line up the paper against the guide on the left edge. Then punch it. 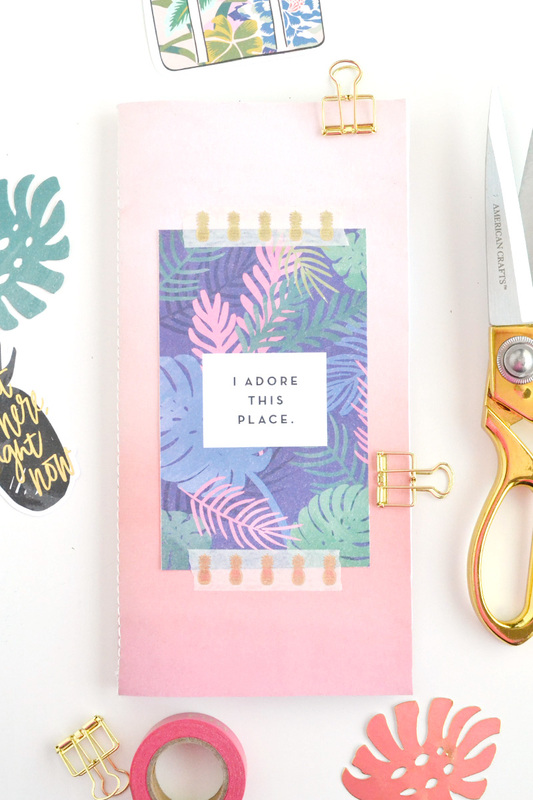 So easy and perfectly adapted to your planner! To give a lovely finished look, I love using the Hole Reinforcer Punch. The kraft paper is the perfect color to contrast with the page and it’s a nice fall color too. You can also add more cards to your planner thanks to the Planner Punch Board. It’s fun to fussy cut the cards you have on some 12×12 papers. Collect your memories by adding your kids drawings into your planner! I love how my daughter draws horses, she’s always making art for me and I just can’t throw them away. So I decided to collect them by trimming the papers and using the Planner Punch Board to keep them forever! And voilà! The finished planner spreads are looking awesome with all those collected memories, photos and drawings! What about you? How much do you love the Planner Punch board? Happy creating everyone and until next time! Hello, We R friends! Enza back with you to share a spread in my new traveler’s notebook using the Journal Guide tool. If you love creating charts, lists, banners, or even little pockets to hold tags, memorabilia, and embellishments, this tool is for you. 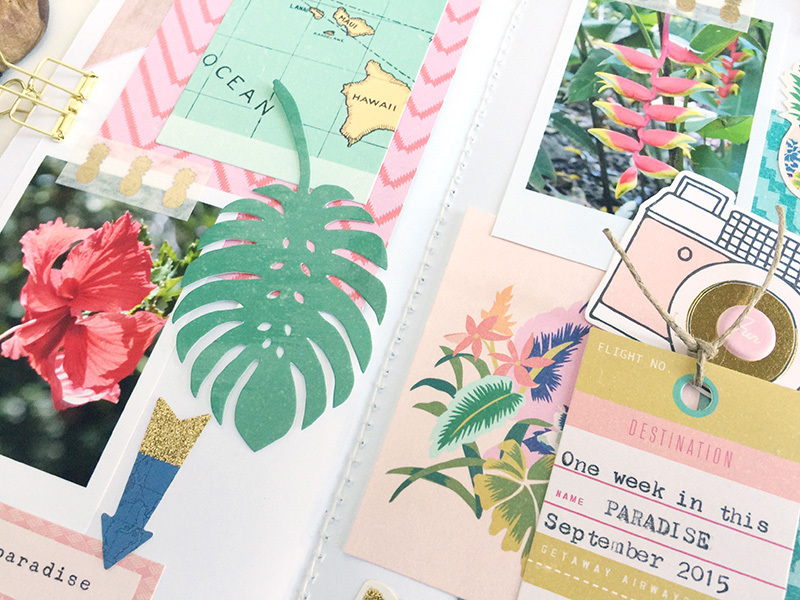 My spread today features the new Crate Paper Journal Studio Collection, which I absolutely love! I started by creating sort of a calendar for the upcoming month. I used the rotating guide to draw two concentric circles and add sections for the days of the month. This tool is very easy to use, and gives you perfect results all the time. Since I like different textures and some dimension on my pages, I decided to use a craft die from my stash to cut the circle; then I die cut a smaller circle from patterned paper to place in the middle, just to embellish it a bit. Next, I created two banners by simply tracing them with the ruler and the right angle guides before fussy cutting them with the Crafter’s Small Precision Scissors. I usually like to have a little pocket or sleeve on the back of the front cover of my notebook, just to hold bits and pieces of the collection I plan to use, or store keepsakes. It is super easy to create your own with the Journal Guide. I simply cut patterned paper to the desired size, folded it around the long end of the tool, and taped the sides; for the bottom, I just folded the flap up and glued it to the back. I created three pockets, that I embellished with washi tape and die cuts from the Crate Paper Journal Studio Collection. I had fun using the Journal Guide to create this opening spread in my November notebook. What will you use this all-in-one tool for? Hello crafty friends! Usually we’re not so happy about Monday mornings, but today we’re super excited to share some new releases that will start shipping to retailers early November 2018! So, if you’d like a little pick-me-up for your Monday morning, scroll down and check out what’s coming soon! If you’re a crafter without a sewing machine but love the look of hand stitching on your projects, this is the tool for you! Create cute embroidery designs and add texture to paper craft projects. The Stitch Happy Pen creates loops on the underside of the paper so you do not have to go back and forth. The frame has strong magnets to keep your paper tight so it doesn’t bend when stitching. It’s perfect for on-the-go crafting too! Store your small embellishments, glitter, beads, and more in these clear sturdy glass jars, shaker jars, vials, and screw stack jars. They come in several different sizes and styles so there’s something for every crafter! Watch for these in stores and online near the holiday season! Hello everyone! It’s Eva on the blog today showing you how to create a fun and easy Halloween garland using the Emoji Punch Board. In Chile we don’t usually decorate our house for Halloween. My son however is really excited about this celebration and asked me if he could put some Halloween things in his bedroom. I made him this spooky garland with some emoji monsters because I knew he was going to love it! To create the garland start by punching some icons with your Emoji Punch Board. I used different colors from this beautiful DCWV Holiday Jewels paper stack. After that, I added some details to my monsters using the scraps from the Punch Board and my Sticky Piercer. Be creative, monsters don’t have to be perfect! Here are all the monsters I did. Let me give you a few ideas: I created the devil’s horns with some smiles in yellow. The one eye monster was created aligning the paper on the mouth side instead of the eyes side. The purple monster has some upside down hearts on the back of his head and to create the mummy I simply glued some stripes before punching the emoji! Finally, I glued all my emojis and letters to some twine with washi tape. And here it is my Hallowee Garland, isn’t it cute? You can use these emojis for some many things: for your planner, as cupcake toppers and to decorate a Letterboard like I did in this post!